How high can we go? 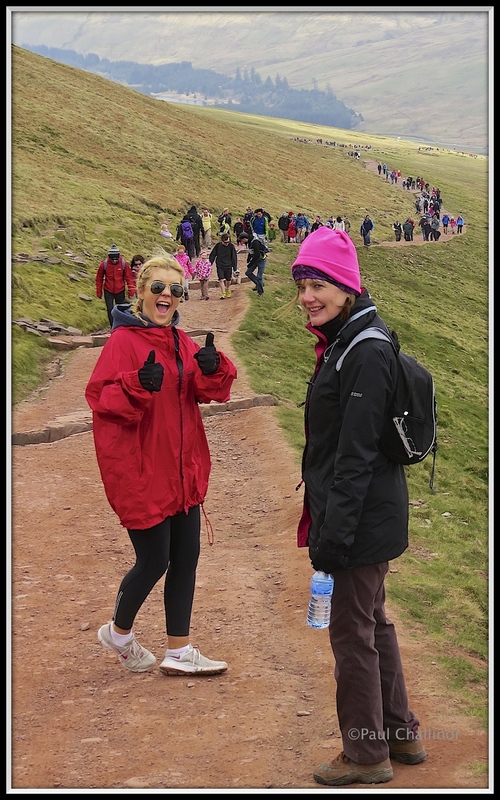 To the top of Pen Y Fan! Number 1 daughter said “I’d like to walk to the top of Pen Y Fan!”. So we called her bluff this morning and dragged her out of bed at 8am on a Saturday – a rare event. We were even out of the house before 9am. An even rarer event! 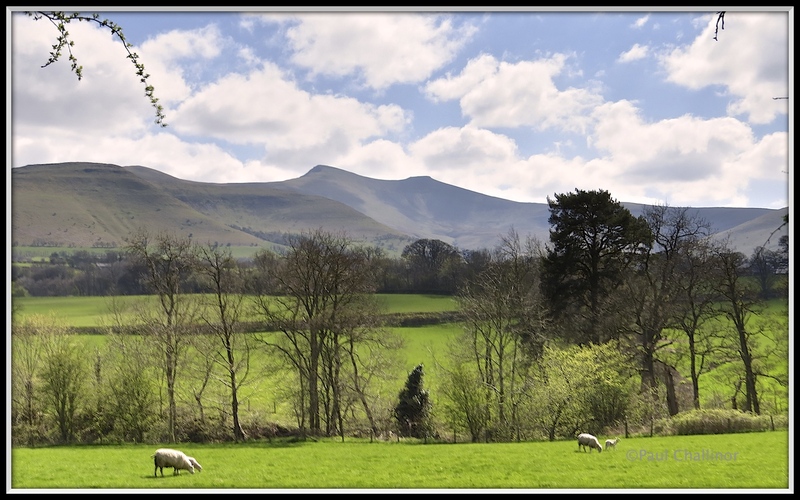 We are lucky in that we live only 40 minutes away from the Brecon Beacons, a fantastic area of hills, perfect for walking. We had the idea that even though it was a bank holiday Saturday if we got to the car park at the Storey Arms early enough there would be no problems with parking. The place was heaving with the world and his wife, all taking up the parking places, and I think we got the last space available in the car park. Despite the sunshine it was pretty parky and as usual Number 1 was under prepared. So I had to dig out a spare coat, which despite being a little large (understatement) it fitted where it touched and comfort was restored. That was until I started to walk up the path – and then quickly confirmed how fat and unfit I really am. Despite the number of cars in the car park it wasn’t too busy on the way – probably because everyone was overtaking me. That’s me just ahead of Aunty staggering up the high like Sherpa Tenzing carrying the supplies. The higher we got the colder it became and even I had to eventually put on a coat. But the clouds stayed away, and the views got better and better. I last time I was up here was about 3 years ago, just after a heavy snow storm and I had the place to myself. Mind you it really was freezing that day. The first peak we came to was Corn Ddu, which translates as Black Horn. This is a small flat plateau shaped like an anvil. At times when the cloud comes over the colour changes and it does look like a black horn. Corn Ddu at 873 m (2,864 ft) is the second highest peak in South Wales. The peak is marked by an bronze age burial chamber, which is now marked by self built cairns. Research has shown that the climate was warmer during the bronze age than it is now, and so farming was possible higher up the hills than it is now. Even so building a burial chamber up her must still have presented a major challenge. But certainly it would made an impact on the surrounding area, marking this area as belonging to a certain tribe. 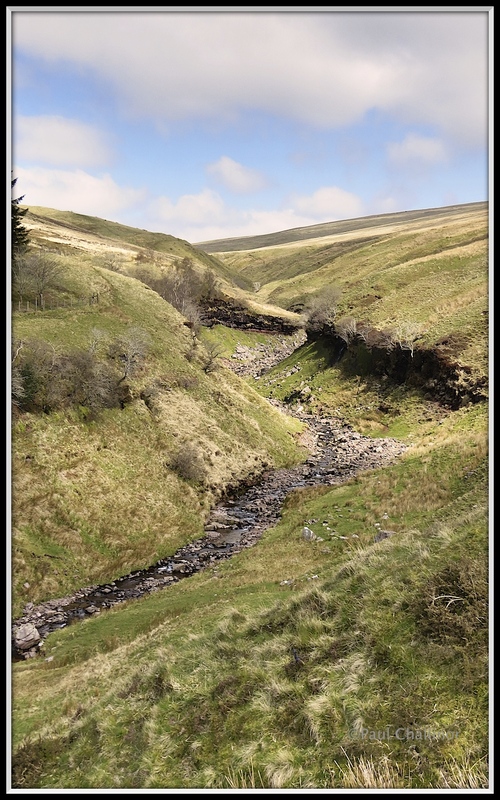 There is another burial chamber on Pen y Fan, which was excavated in 1991 and a broach and spear head were found. After a short period here we made our way along the saddle to Pen Y Fan. 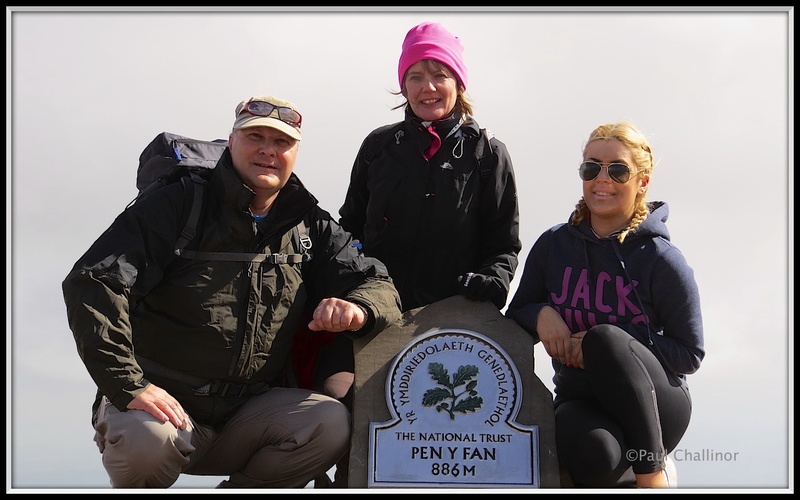 “Fan” translates as top place, can so the best translation of Pen Y Fan could be Top of the This Place. Pen Y Fan sounds better though. 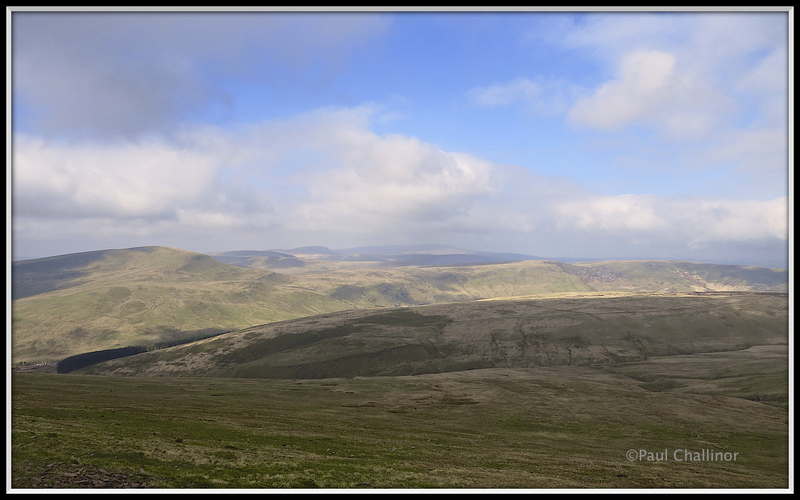 Looking towards Pen Y Fan. 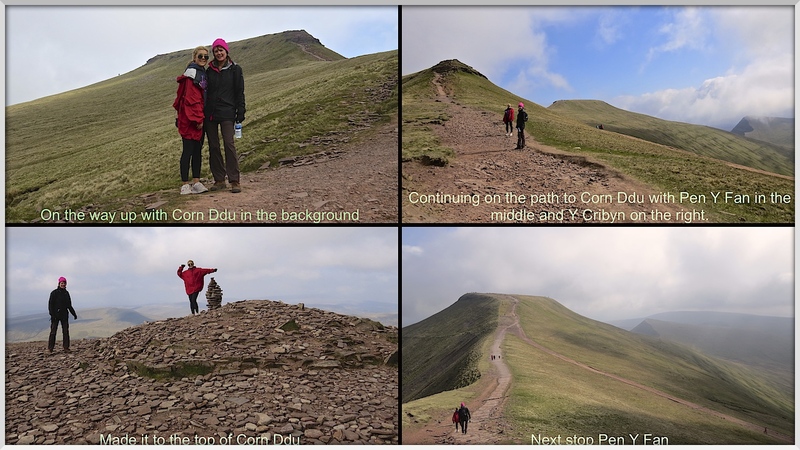 Pen y Fan and Corn Ddu is formed from ‘Old Red Sandstone’ which were laid down during the Devonian Period. During the ice ages they were able to create their own glaciers which created the valleys of Cwm Llwch and Cwm Cynwyn. Tucked under the peaks of Corn Ddu and Pan Y Fan is the magical Llyn Cwm Llwch. Legend has it that there is an enchanted island invisible from the shore.A passageway leading from a rock to the island was said to be open on May Day each year. Those who had the courage to pass through the doorway would find themselves in a beautiful garden on the island inhabited by fairies. The fairies would play enchanting music, tell stories of future events, and present visitors with exquisite flowers and luscious fruit. But each guest was told nothing must be taken from the island. But one May Day, a greedy visitor placed a flower he had been presented with in his pocket. When he emerged from the rock the flower vanished and he lost all his senses. Since that day, the door to the island has never opened. Pen Y fan was a lot busier than Corn Ddu, but we found a spot for a hot cup of coffee. We conquered the mountain! On top of the Pen Y Fan cairn. Passing the crowds struggling up the path. 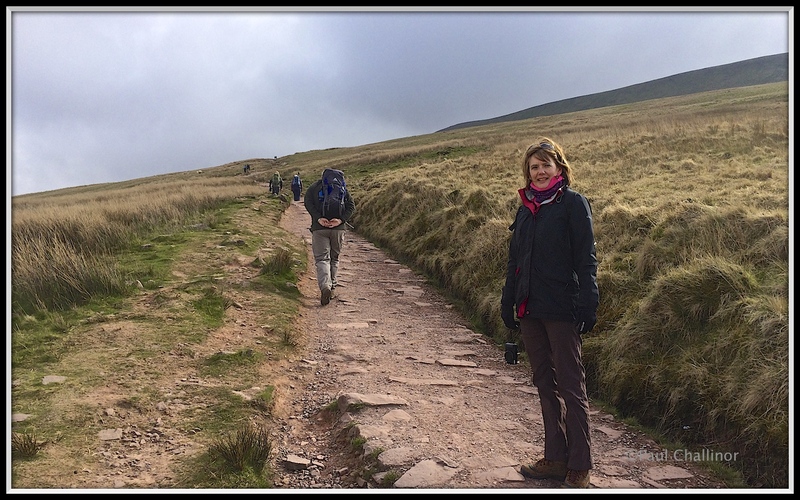 After a pick up from the coffee it was time to head back down the path and to a pub lunch in Brecon. We didn’t expect to see the sheer number of people struggling up the path as we skipped our way back to the car. It was almost a single conga line all the way. A fantastic walk, a fantastic morning. Number 1 and Aunty are even talking about walking up Fan Fawr and Fan Llia in the future. Though, hopefully it will be a little warmer. Next Next post: Trinidad here we come!